Discover Newport Hotels, Motels, Bed & Breakfasts, Resorts and private rentals. Private rentals are often homes or condos. Area hotels provide sleeping accommodations on a room/suite basis. Bed & Breakfasts offer short-term lodging in private homes. A resort is commonly a hotel with added attractions on the premises, making it a self-contained vacation experience. Let us help you find accommodations in Newport, Oregon. Newport Oregon.com offers detailed information on a variety of other places to stay in or near Newport. 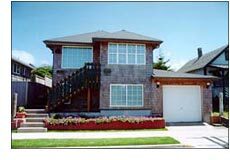 Renting a home or condo for your vacation to the Oregon coast is always an option and one of our favorites. Located close to the ocean, this Cape Cod style house was originally constructed in 1905. This two-bedroom cottage will sleep six people easily. You'll fin one queen and on full size bed and a queen-size sleeper sofa in the living room. This Newport, OR beach house is conveniently located just 3 miles south from Newport's historic bay front and the Yaquina Bay Bridge, The Oregon Coast Aquarium, and other Newport attractions. A Part of My Heart allows you to lose yourself in the sweeping ocean views and crashing white water from just about every window, search the horizon for whale spouts, wish upon one of a million stars that fill the nighttime sky. Stay at the Beach Cottage at Nye and wander through the charming shops, partake of fine foods at nearby restaurants, walk to the Performing Arts Center, or stroll on the four-mile beach. The Crow's Nest is a retreat to the good life in a five-bedroom, three-bath beach house located in a heavily wooded area, on a high bluff overlooking the beautiful Pacific Ocean. Located in historic Nye Beach, the Nye Cottage is two blocks from the ocean and offers a wealth of shopping experiences. The Waves of Newport Motel and Vacation Rentals are located on a bluff at Jump Off Joe in the historic area of Nye Beach in Newport on the beautiful central coast of Oregon.